» News & Events » Established a research community model between supervisors and post-graduate students. Established a research community model between supervisors and post-graduate students. On the 30th of August, 2018, ULIS-VNU held a seminar in relation to the establishment of a research community model between supervisors and post-graduate students. 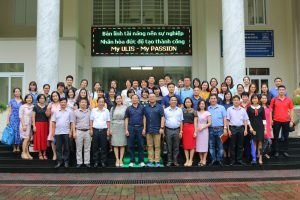 The seminar was attended by Ulis President Do Tuan Minh, Vice president Ngo Minh Thuy, Vice president Lam Quang Dong, representatives of units of the University, Professors, association Professors and other lecturers. 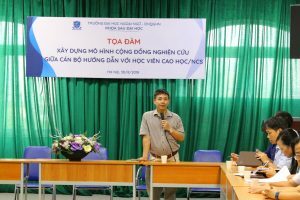 Chaired the seminar, Vice president Lam Quang Dong indicated the aim of the seminar was to have a deeper look, listen and understand some research community model between supervisors and post-graduate students from which some certain methods and directions would be offered. 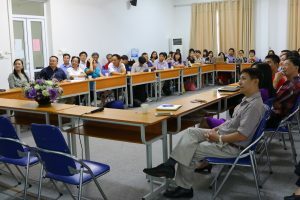 Besides, the seminar was a chance given for researchers to exchange methods to establish a research community, a research group. Sequently, the community would share research ideas and directions. 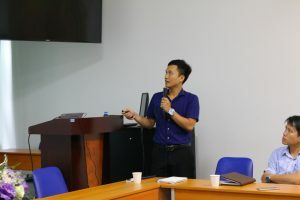 Delivering a presentation ralated to “Zemi”, a research model in Japan, Deputy Head of the Cooperation and Development Office Bui Dinh Thang indicated some positive and new of this model. After the presentation, all of the researchers had a straight – forward, constructive discussion in order to contribute to direct the research community model between supervisors and post-graduate students. The seminar ended in a positive atmosphere. All of the researchers looked forwards to seeing the establishment and effectiveness of the research community model.